Dental phobia is quite common, but at Capital Smiles, Dr. Shiloh Lieberman and Dr. Erin Page successfully treat nervous patients every day thanks to sedation dentistry . With it, our team can alleviate any stress or discomfort you may feel in the dental chair so you can finally take care of your teeth with peace of mind. 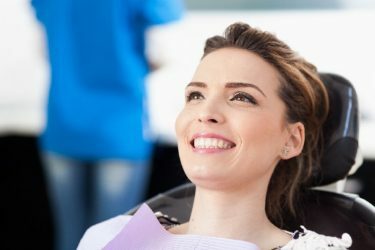 If you regularly experience a small amount of dental anxiety, then nitrous oxide sedation may be perfect for you. We can use it to quickly and easily make your appointments more comfortable and help you get right back to your day without missing a beat. “I broke a tooth last week and was forced to go to the dentist. I struggle with anxiety and was dreading this appointment. It could not have gone any better. The entire staff was so accommodating and understanding. The anxiety that I had slowly drifted away and by the end I was almost in tears I am so happy I found this place. " Nitrous oxide (NO2) is better known by another name: “laughing gas.” The reason for that is when patients inhale it, it creates a light, happy, and floaty feeling that sometimes causes them to get the giggles. Nitrous oxide has been used for well over 100 years to help anxious dental patients, and at Capital Smiles, we’re able to use it with a wide variety of dental procedures so you can come see us confident that you’ll always have a pleasant experience. Who Could Benefit From Nitrous Oxide Sedation? For this sedation method, all you’ll need to do is breathe in the colorless, odorless gas through a small nasal mask to start feeling more relaxed and calm. The mask will stay on for your entire appointment, and your dentist can adjust how much nitrous oxide you are receiving throughout to ensure your comfort. Once the procedure is completed and the mask is removed, the effects of the gas will wear off within minutes, allowing you to go straight back to your day without interruption. Is Nitrous Oxide Sedation Right For You? If you believe this kind of sedation could help you at your next dental visit, please give us a call and let us know. Both Dr. Lieberman and Dr. Page are certified by the Dental Organization for Conscious Sedation, so they will be able to answer all of your questions. We’ve used nitrous oxide to literally help thousands of patients over the years, and it could do the exact same for you. If you’d like to learn more about nitrous oxide sedation, or if you’re interested in having it at your next appointment, please contact us today . With our sedation methods and gentle touch, we’ll completely change how you think about going to the dentist!